There are several different types of wills and codicils that are important to determining which is appropriate for your specific needs. 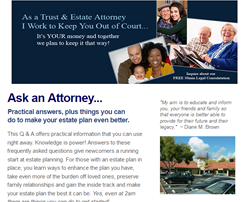 Below, you will find information so you can better understand the basics about the types of wills we prepare for our clients. A Simple Will – This type of will may be appropriate for a person who has less than $150,000 worth of assets, or who is not concerned with avoiding probate. A valid will must be either entirely typed or may be handwritten, but not both. See below for an exception in the California Statutory Will. Holographic Will – A person may write his or her own will. It must be entirely in the testator’s handwriting and signed. Although dating is not required, it is a good idea to date a holographic will. 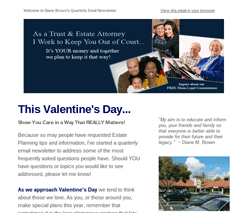 This kind of will may be more subject to a will contest simply because the testator does not have the expertise to think of all of the options. Also testators feel free to write successive wills, often not dating them. Finally, if the testator does not cover everything, then the State of California probate code will determine how the document is completed. California Statutory Will – This form was designed by the California Bar Association to be completed by a testator. It is a “fill in the blanks” form with directions. There is more than one kind of Statutory Will. Read each form carefully to be sure it fits your needs. Free Wills – Senior Adults Legal Assistance provides free consultation with an attorney to prepare a will for a qualifying senior. SALA has a panel of volunteer attorneys who provide this service. SALA also will draft an Advance Health Care Directive. 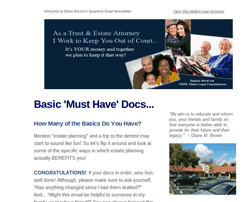 The Pour Over Will – If the decedent has a trust, then the will is a back up document. Such a will typically provides for the distribution of decedent’s tangible personal property (household furniture and furnishings, vehicles, etc.) because such assets are not probated. It also has a “pour over” provision that puts any assets into the trust that the Settlor left out. Changes to a Will – A change to a Will is called a Codicil. A codicil has the same requirements as does a will. If major changes are required, then a new will is recommended. Codicil – A codicil can add and/or subtract information from an existing will. It may also modify the terms of the original will. A codicil is a formal written amendment and in order for a codicil to be deemed valid, it must be dated, signed, and witnessed in the same way a will would be. In addition, it must make some specific reference to the will it amends. When this person dies, the original will and the codicil are submitted together for approval by the court. They are both reviewed and determine the basis for the estate administration and determine the distribution of the writer’s belongings to the heirs. Should you have questions, please remember to print and use your Free 30 Minute Legal Consultation.